iPad is the perfect gadget for reading manga, manhwa, and comic books, and MangaBlade is the perfect app for it. MangaBlade combines three important elements for manga consumption: a user interface designed specifically for iPad, seamless integration with online manga catalogs, and the ability to import your own manga. It'll rock your world! Featured on iPad Entertainment New & Noteworthy in Singapore & Italy App Stores! - FULLSCREEN READING: Buttons and bars fade away so you can immerse yourself into the story. 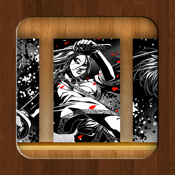 - PORTRAIT OR LANDSCAPE: MangaBlade automatically rotates the manga when you rotate your iOS device. - LEFT OR RIGHT: Supports both the American left-to-right comic reading or the Japanese right-to-left manga format. - FAMILIAR CONTROLS: Double-tap zoom, pinch to zoom, swipe from page to page; everything you are already familiar with on your iOS device. - BRIGHTNESS CONTROL: Like to read in the dark? MangaBlade lets your turn down the brightness with ease. - COVER FLOW: Find your pages fast with a beautiful Cover Flow-like interface. - BROWSER: Browse any website from within MangaBlade. - DOWNLOADER: Download CBR, CBZ, RAR, or ZIP files from any website. Install new manga even without a computer. - BOOKMARK: Bookmarking support allows you to keep track of your favorite manga portals with ease. - DOWNLOAD FROM ANY WEBSITE: Download from any website to your iPad for offline viewing. Perfect for commuters. - LOAD YOUR OWN MANGA: Load your own manga or comic onto MangaBlade via iTunes' USB File Sharing feature. Some say it is 100 times faster than WiFi. - MULTIPLE FORMAT SUPPORTED: MangaBlade supports CBR, CBZ, RAR, and ZIP. - RUNS IN BACKGROUND: Enjoy uninterrupted downloads and imports when switching to another app. 1. Connect your iPad to your computer via USB. 4. Click on the "Apps" tab. 5. Scroll down to the "File Sharing" section. 7. Drag and drop your manga/comic files into the "Documents" section. 8. Your files will automatically be imported the next time you run MangaBlade. 9. If MangaBlade is already running, simply tap the Refresh button.